A complete step by step tutorial on Introduction to DS18B20. Hello friends, I hope you all are doing great. In today’s tutorial, we are gonna have a look at detailed Introduction to DS18B20. DS18B20 is a temperature sensor which can measure temperature from -55oC to +125oC with an accuracy of +- 5%. It follows 1 wire protocol which has revolutionized the digital world. Because of it’s 1 wire protocol, you can control multiple sensors from single pin of Microcontroller. DS18B20 is a digital temperature sensor which follows 1-wire protocol and can measure temperature from -55oC to +125oC ( -67oF to +257oF ) with an accuracy of +-5%. Data received from single wire is in the ranges of 9-bit to 12-bit. 1-wire protocol is an advanced level protocol and each DS18B20 is equipped with a serial code of 64 bit which helps in controlling multiple sensors via single pin of of microcontroller. In simple words, it assigns different addresses to all sensors attached and by calling the address, you can get that sensors’ value. Pin # 1: Vcc ( We have to provide +5V here ). Pin # 2: Data Pin ( It’s the 1-wire from where we will get temperature readings ). Pin # 3: GND ( We have to provide ground here ). I have assembled a table where I have added all the features and characteristics of DS18B20. 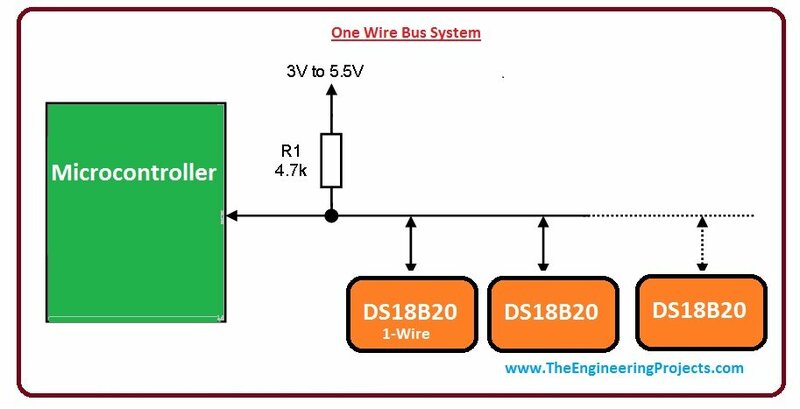 As I told earlier that DS18B20 follows 1 wire protocol, so in order to understand its working, we must have a look at this protocol first. Main advantage of 1 wire protocol is that we can control multiple 1-wire devices via single pin of Microcontroller. You must have heard of master slave system, where 1 master device can control or communicate with all slave devices. 1-wire protocol follows similar master slave system, where microcontroller acts as a master and all our 1-wire devices e.g. DS18B20 act as slaves. If we have interfaced only one device with our microcontroller then such a system is called single drop but if we interface multiple 1-wire devices via single pin then it’s called multi drop system. In this method, we provide power to DS18B20 by conventional method i.e. battery or adapter. This method is applicable for temperature below +100 degree Celsius. Main benefit of this method is, there is no extra load on resistor which use in this method and it perform work correctly. In this method we do not need special power supply. This method is used for temperature greater then +100 Celsius. But, in special work when DS18B20 convert temperature value into digital then current value increase to such value which can damage resister. To limit current in save value and good working of DS18B20 it is necessary to use pull up mosfet. As, it is use only for specific temperature value there we use external power supply. It works on the principle of direct conversion of temperature into digital value. Like, it changes bit in 9. 10 ,11,and 12 bits as temperature changes in values 0.5 °C . 0.25°C,1.25 and 0.0625°C respectively. It has alarm and lcd as temperature changes alarms work and temperature value changes which we can get from lcd. One SRAM and other is EEPROM. Convert T[44h] : This command starts the single temperature conversion. Write scratched Pad [4Eh]: In this command we can write data on memory of DS18B20 to three bytes. Data is transferred in least multiple bit first. 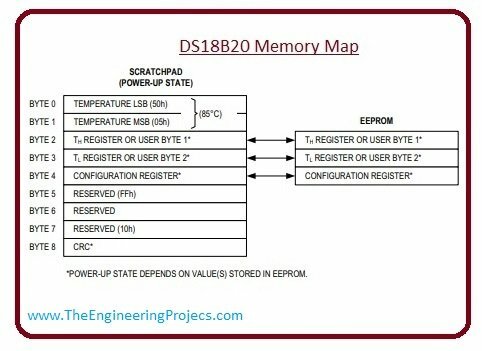 Read Scratched Pad[BEh]: In this command we can read data on scratched pad memory of DS18B20. Copy Scratchpad [48h]: This commonds data from scratched pad and send data to EEPROM in 2 , 3 and 4 bytes. 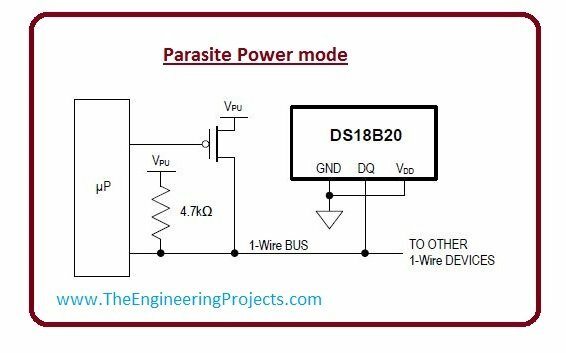 Read Power Supply [B4h]: This command tells about power supply mode of DS18B20. We can use it in thermostat controls system. It can be used in industries as temperature measuring device. It can be used as thermometer. We can use it in thermally sensitive devices . It can also use in HVAC systems. Very well written. I have one request plz add some circuit diagram for practical understanding. The DS18B20 has a unique 64-bit serial code and allows to function on the same 1-wire bus. Only one microcontroller is needed to control multiple DS18B20 over a large area. It also provides benefits to machinery, process monitoring, and control systems.